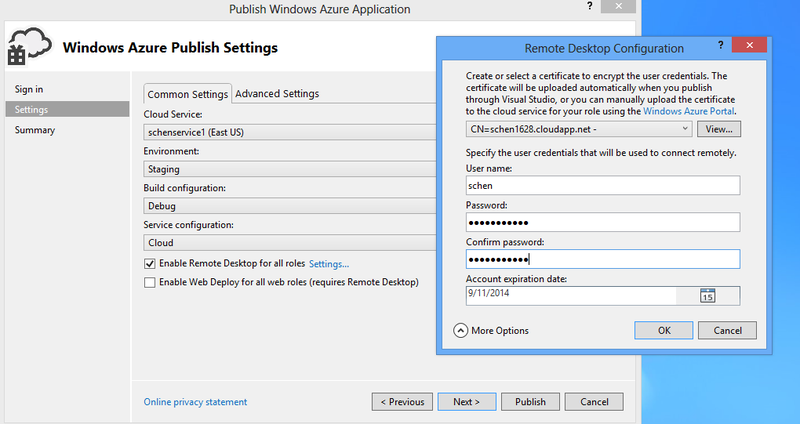 This post is inspired by the Connecting Windows Azure to Amazon post that Michael Washam wrote. 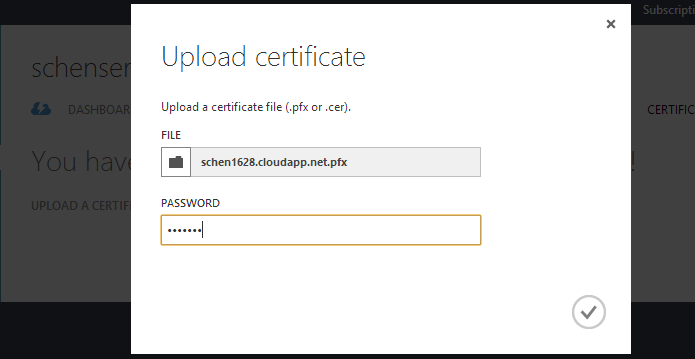 In his post, he showed how to connect a Windows Azure Virtual Network (VNET) to a Virtual Private Cloud (VPC) hosted in Amazon Web Services (AWS) with a site-to-site VPN and OpenSwan. 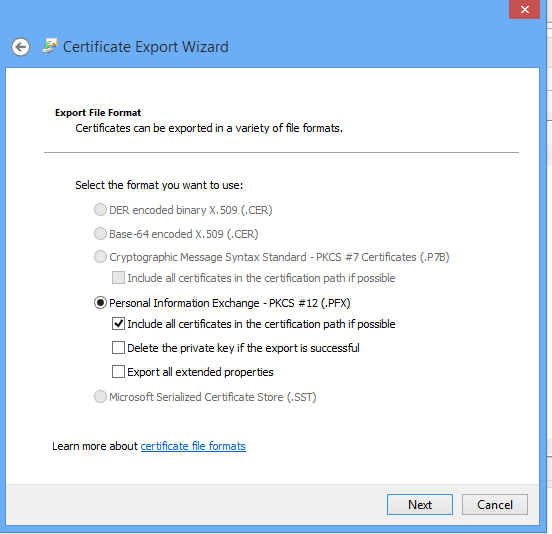 I will extend his post to show you how to connect multiple Windows Azure VNETs together. I will use the following architecture diagram as an example for illustration. The address space for the VPC in AWS is 10.10.0.0/16, and there are four VNETs in Windows Azure with the following address spaces. 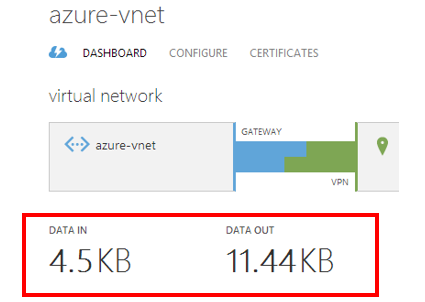 The VNETs do not have to be in the same Windows Azure account, and they don’t have to be in the same region. The address space has to be unique among VNETs and VPC. You need to create one local network per VNET. You can create a Local Network when you create a VNET, but I recommend to create Local Networks in advance. Then you can just pick a Local Network from the drop down list when you create a VNET. There are four VNETs so four Local Networks are required. The Address Space of each Local Network is basically all other address spaces minus the address space of the VNET. I called the Local Network as vnet16-local, vnet20-local, vnet24-local, vnet28-local for VNET 16, VNET 20, VNET 24, and VNET 28 respectively. Local Networks in Windows Azure are equivalent to Route Tables in AWS. The VPN Gateway Address is the Elastic IP of the OpenSwan Linux instance in AWS. In the OpenSwan Linux instance, you will need to create four connections. I recommend to use one configuration file per connection under /etc/ipsec.d folder. The files have to have .conf as an extension. I called them aws-to-vnet16.conf, aws-to-vnet20.conf, aws-to-vnet24.conf, and aws-to-vnet28.conf respectively. The format of the configuration files are slightly different than the one Michael showed. 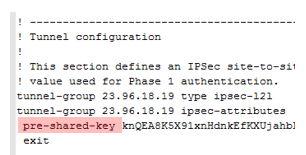 [CONNECTION NAME] – The name of the IPSec tunnel connection. I would just use the name of the configuration file without the extension, such as aws-to-vnet16. You will need to update the /etc/ipsec.secrets file to include one entry per VNET with the following format. 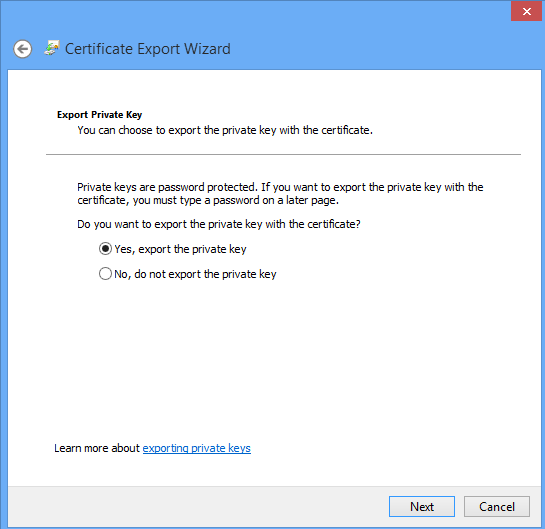 [PRE-SHARED KEY] – The pre-shared key of the VNET Gateway. 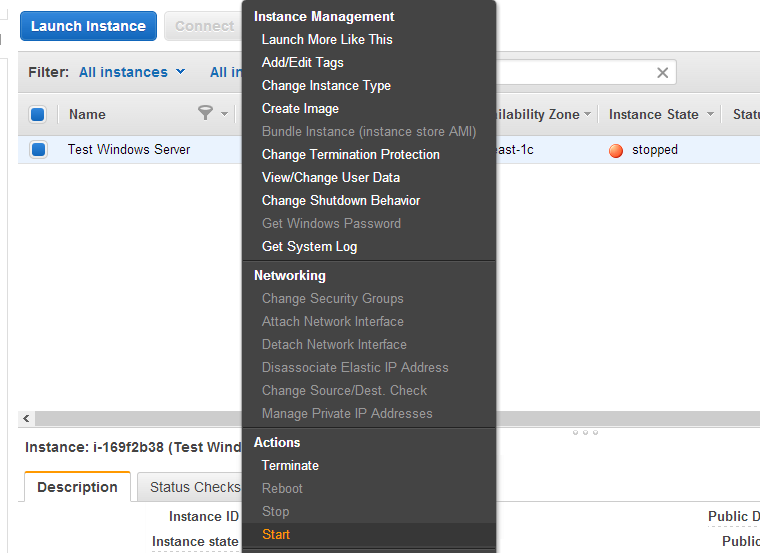 You can retrieve it from MANAGE KEY in the VNET Dashboard. This is the sample /etc/ipsec.secrets. Don’t forget to update the Security Group in AWS to allow UDP 500 and 4500 from Azure VNET Gateways to the OpenSwan Linux instance. Restart the ipsec service in the OpenSwan instance to establish IPsec tunnels between VPC and Windows Azure VNETs. 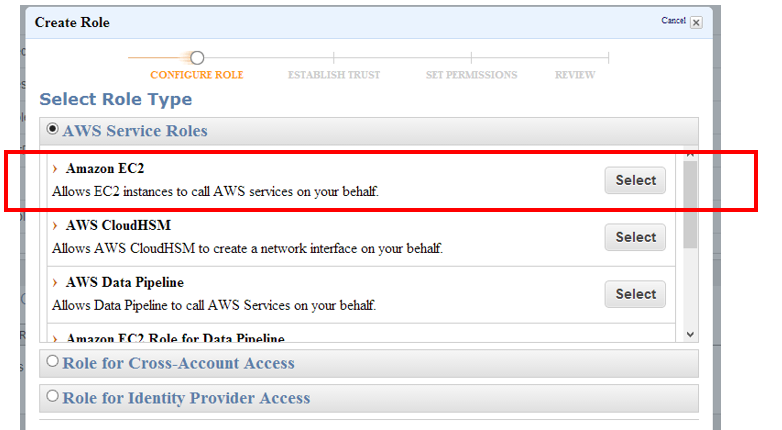 If you need other instances in your VPC to connect to Windows Azure VNETs, you will also need to add route entries to the Route Table in AWS. The Destination is the Windows Azure VNET Address Space, and the Target is the Elastic Network Interface or the Instance of the OpenSwan Linux instance. 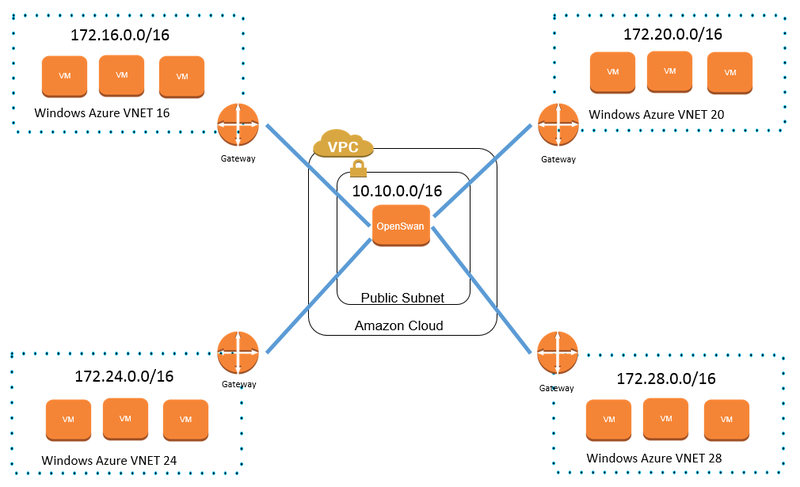 You should be able to communicate among VNETs through AWS. Please notice the OpenSwan Linux instance is a single point of failure in the architecture. You may want to consider to create a second elastic network interface for the OpenSwan Linux instance and set up a standby OpenSwan Linux instance for fail over. When the primary OpenSwan Linux instance is down, you can switch the second elastic network interface to the standby OpenSwan Linux instance to take over the primary OpenSwan Linux instance. I was working with a customer to set up a site-to-site VPN between Windows Azure and a corporate network. 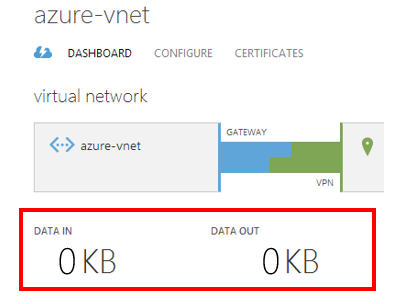 On the Windows Azure Virtual Network Dashboard, it showed the VPN tunnel was connected but data in and out were 0 KB even after a long time. Firewalls were open to allow the Windows Azure gateway in the corporate network. What went wrong? The router on the corporate network was Cisco ASA 5500 Series device with ASA OS version 8.4. 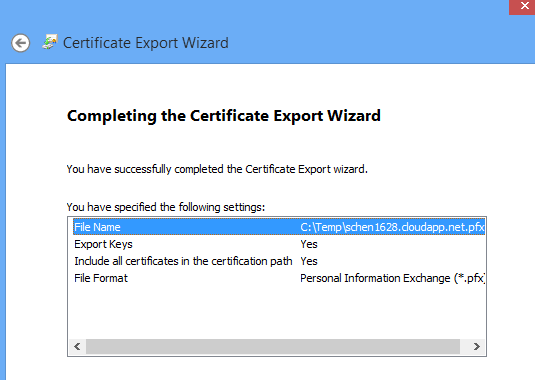 A VPN configuration script was downloaded from the Virtual Network Dashboard in Windows Azure but the script was for OS version 8.3. Obviously, the script did not work well for OS version 8.4. It ended up two changes were required for the following sections to resolve the issue. 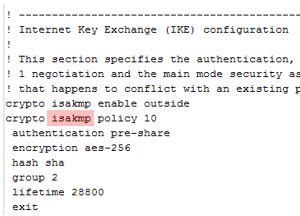 In this section, replace isakmp with ikev1 on the second line before policy 10. 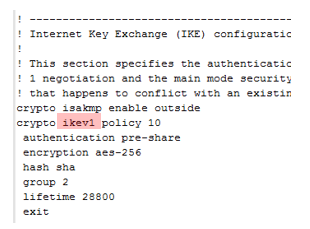 In this section, add ikev1 in front of the keyword pre-shared-key. After re-running the modified script in the Cisco VPN device, the IN/OUT KB started to increase. VMs were able to communicate between the two networks via PING. Everything seemed to work fine. It is always a good practice to shut down the instance before detaching the root volume to make sure I/O is suspended to prevent it from corrupted. 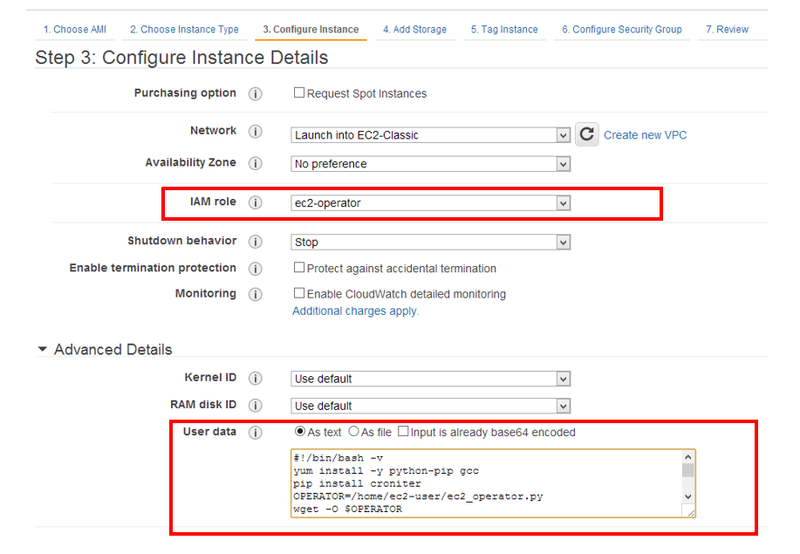 It can be done through the EC2 Dashboard. All you need to do is to highlight the Windows instance and select the Stop option to shut down the instance completely. 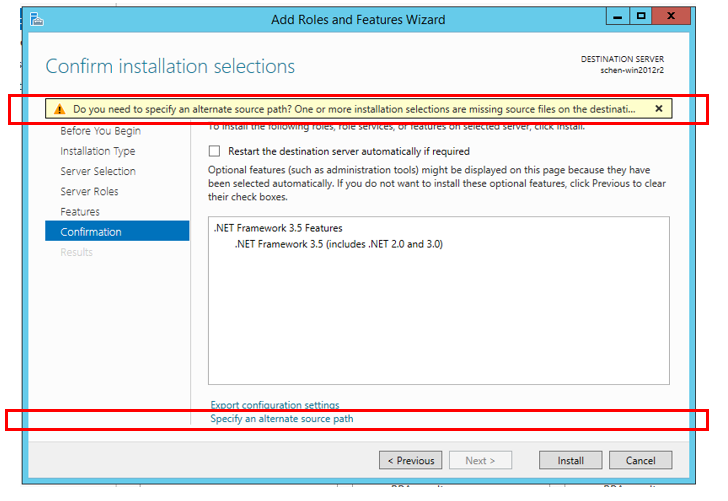 You will need to detach the root volume before you can attach it to another instance in the same availability zone. You can use the instance ID to locate the root volume and select the Detach Volume option to make it available for another instance. You may see a few volumes if you have other volumes for the Windows instance. You only need to detach the root volume, which is attached as /dev/sda1. Before detaching the root volume, you may want to write down the volume ID and even tag it to help you locate it later on. I recommend to attach the volume to a running Linux instance. You probably can attach it to another Windows instance but doing so will make the volume non-bootable and prevent the original Windows instance from booting it up properly. After attaching the volume to the Linux instance, you should be able to see a message in the /var/log/messages log file to indicate the volume is detected within the Linux instance. You can use the tail command to confirm it. 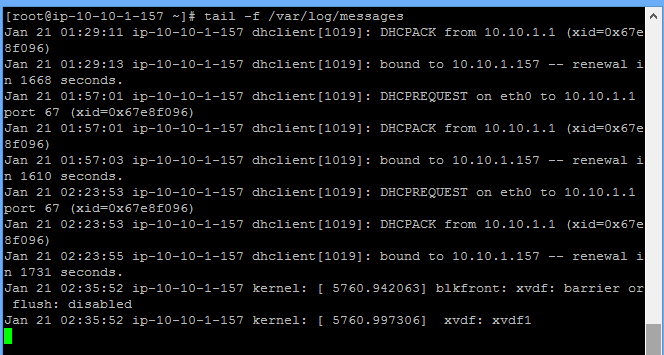 I attached the volume as /dev/sdf, so it was attached and mapped as xvdf1 in the messages log file. Before you can mount the volume, you will need to create a local directory for the mount point. You can use mkdir to create an empty directory. Let’s call the directory /mnt/c-drive. Now it is time to mount the volume assuming the device is xvdf1 and the mount point is /mnt/c-drive. Replace them accordingly to reflect your settings. Once the volume is mounted, change the current directory to the Settings directory. 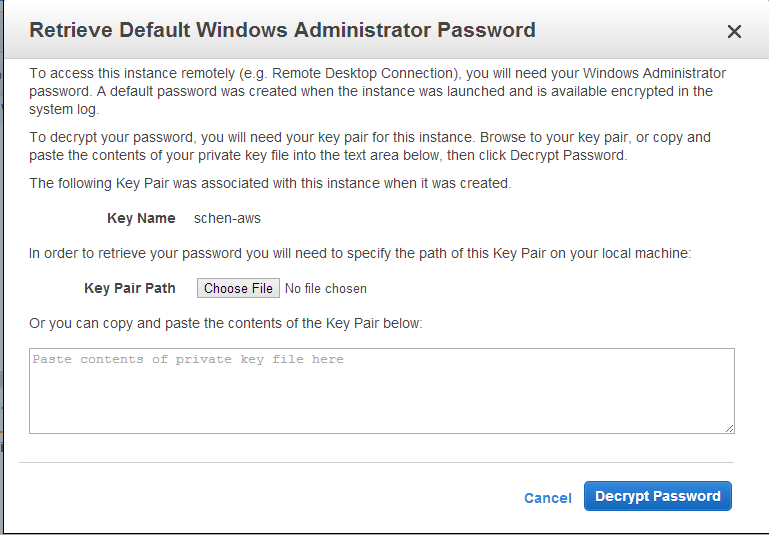 In the config.xml, set the state of the Ec2SetPassword parameter to Enabled and save it. Get out of the /mnt/c-drive directory and umount it so that you can detach it from the Linux instance gracefully. The config.xml is edited and the volume is unmounted. The volume is ready to be detached from the Linux instance and re-attached back to the original Windows instance. 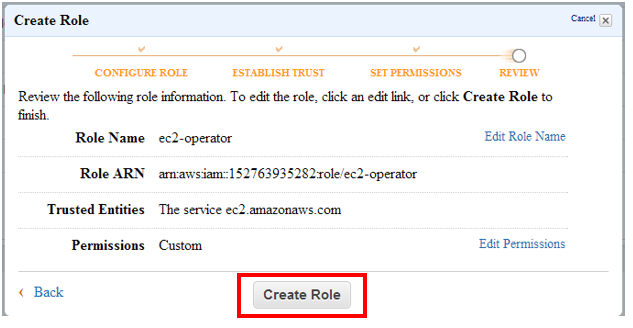 You can perform these actions in the Volumes section of the EC2 Dashboard. When you re-attach the volume, make sure to set the Device field to /dev/sda1 to indicate this is a root volume. Otherwise, the Windows instance will not be able to start. The instance is still in the stopped state. 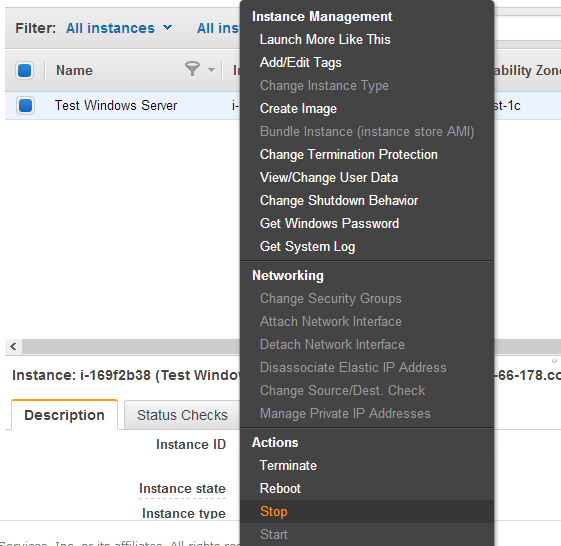 You can start the instance from the EC2 Dashboard console. It may take 15-30 minutes to get the new password generated. 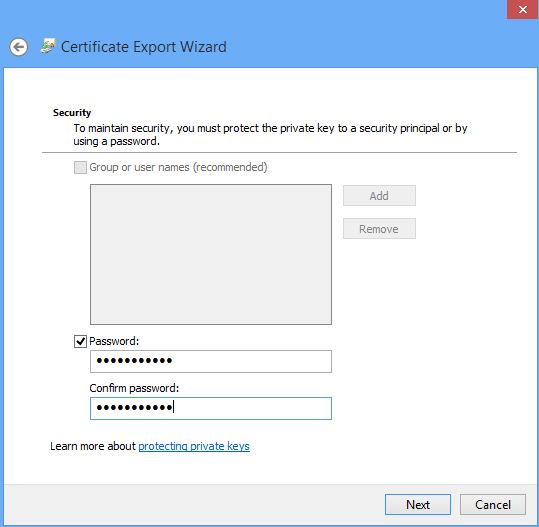 You can use your key pair to retrieve the new password with the Get Windows Password option and log into the Windows instance. 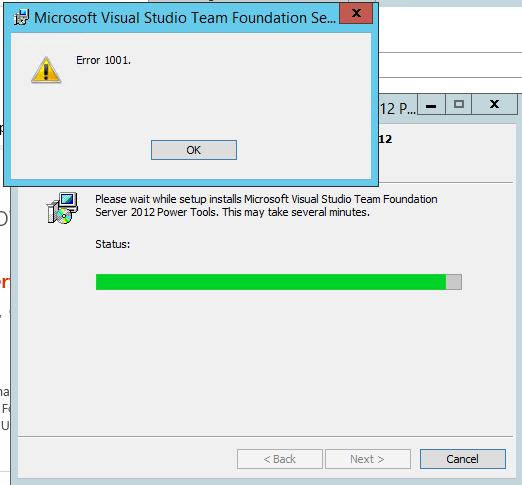 It was pretty frustrated to keep getting the error 1001 when I tried to enable the TFS PowerShell Cmdlets feature during the installation of the Team Foundation Server 2012 Power Tools in Windows Azure. If I did not select the TFS PowerShell Cmdlets, the installation went well without any errors. The error appeared whenever I wanted to enable the TFS PowerShell Cmdlets feature. I found out that the TFS PowerShell Cmdlets required .NET Framework 3.5 Features. However, it was not enabled on the Windows Server 2012 r2 IaaS VM instance I created through the Microsoft image in the Gallery . It also did not include the source to install .NET Framework 3.5. I was able to confirm it with the Get-WindowsFeature PowerShell Cmdlet. 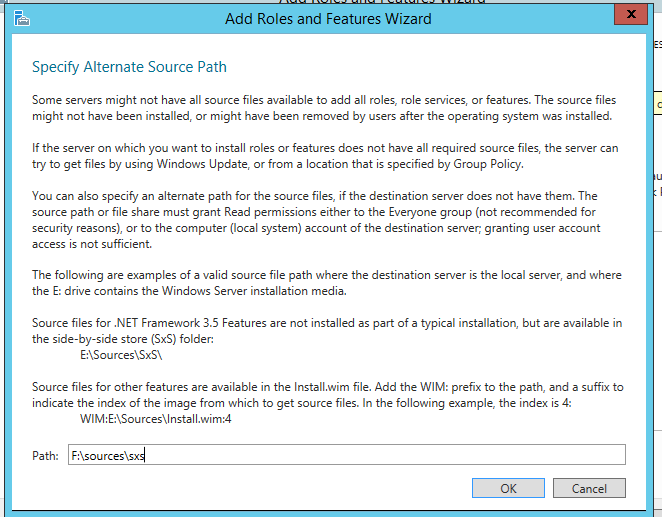 When I tried to install the .NET Framework 3.5, the Add Roles and Features Wizard displayed a warning to inform me if I wanted to specify an alternative source path . Please notice it was just a warning. It still allowed me to proceed even I did not specify any alternative source path. Of course, the re-installation of the TFS PowerShell Cmdlets did not work. It still gave me the same error 1001. It took me a while to realize that the .NET Framework 3.5 was not installed properly. Because I did not have the source for the .NET Framework 3.5, I just downloaded the ISO file of the Windows Server 2012 r2 from MSDN and mounted it. It only took a minute or two to download the ISO file within Azure. It was pretty quick. Then I just clicked “Specify an alternative source path” to point to F:\sources\sxs where the source was. The wizard did not provide an option to browse the folder, so I had to enter the path manually. With .NET Framework 3.5 properly installed this time, the re-installation of the TFS PowerShell Cmdlets was completed successfully without any errors. 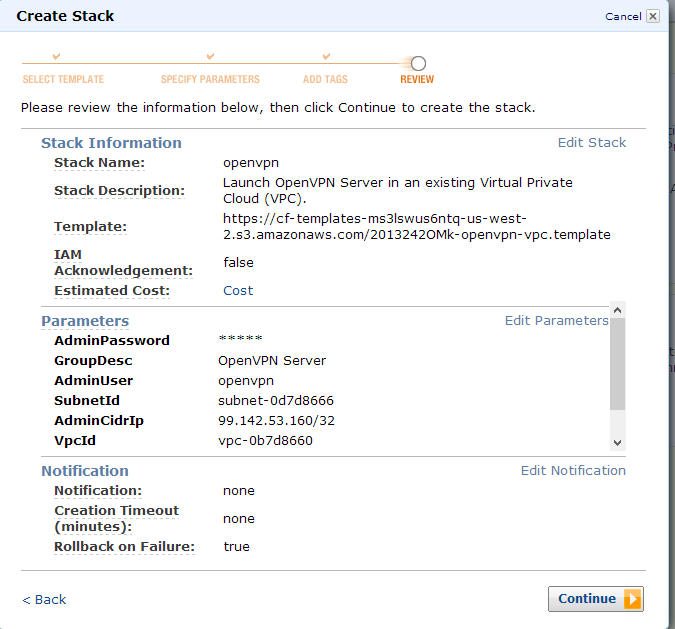 This post is to continue on the my previous post about Setting up OpenvPN Access Server in Amazon VPC. 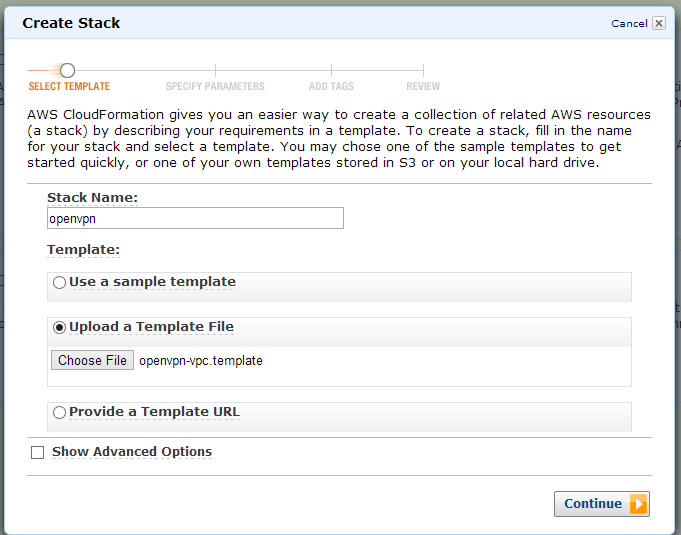 To make it easy to launch it in an existing AWS VPC. I have put together a CloudFormation template to automate the process. You can find the CloudFormation template in my github repository. 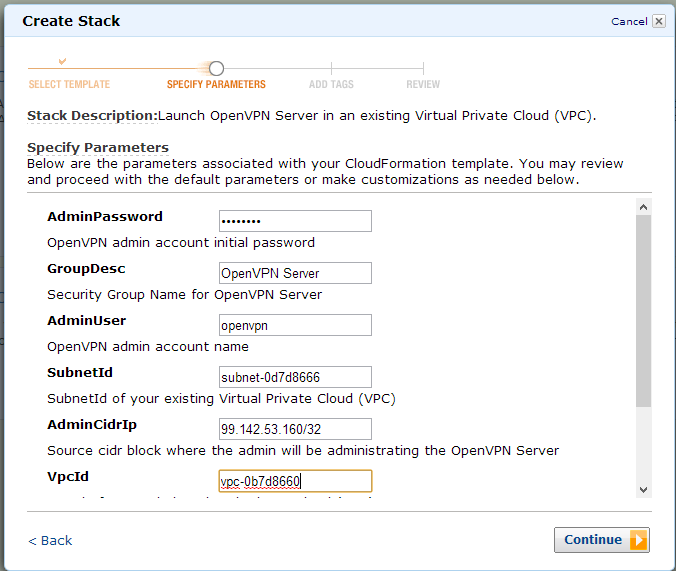 You will be able to set up a OpenVPN Access Server with the cloudformation template in the CloudFormation Management Console. Click Create New Stack button to start the process. Give a stack name and specify where the template. The stack name is case-sensitive and has to be unique within your AWS account. It must start with a letter and can only contains alphanumeric characters. In other words, no spaces or special characters are allowed. You will need to enter a few inputs to specify things like VPC ID, Subnet ID, Admin user name, password and the like. Add optional tags to mark whatever resources that are created by the stack to help identify them. The final step is to review and click Continue button. The stack will be created and ready shortly. You should be able to get the OpenVPN’s URLs in the Outputs tab of the stack. The Parameters section defines the inputs that you will need to to create the OpenVPN Access Server and related infrastructure components. 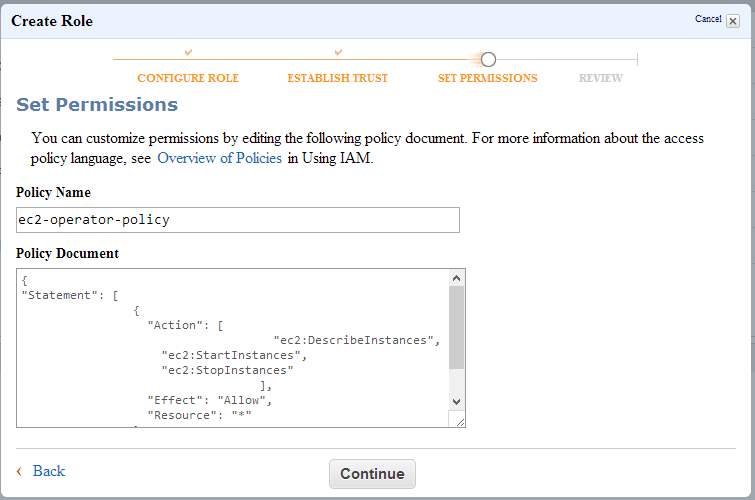 The Mappings sections define what AMI should be used while launching the OpenVPN Access Server. It is essential a mapping table between regions and AMIs. Each region uses a different AMI. TCP 443 – Users log into the OpenVPN servers via this port. UDP 1192 – VPN connections are running through this port. TCP 943 – Admin Portal is running out of this port by default. These ports can be changed in the OpenVPN Admin portal if needed. The IPAddress resource allocates a public IP (elastic IP) which will be associated with the OpenVPN Access Server. Users will need to access the OpenVPN Access Server via this public IP. The Instance resource launches the OpenVPN Access Server. Depending on the region you run the cloudformation template, it will select the appropriate AMI accordingly. 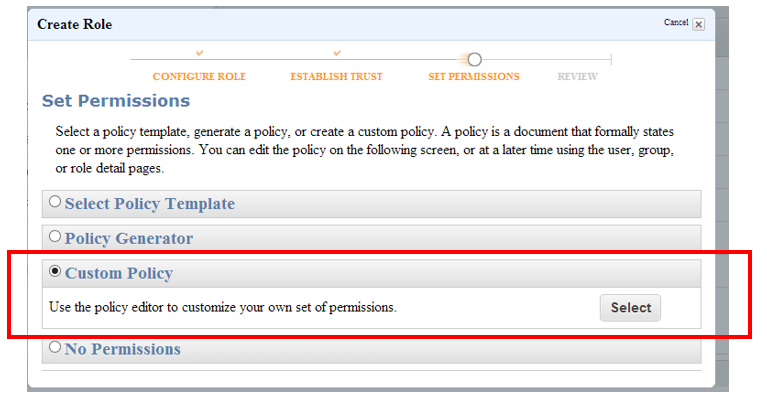 It will supply the admin user name, initial password and public IP as user-data to the instance. You no longer have to SSH to the OpenVPN Access Server console to run the initial configuration. Since the user-data is stored as clear-text in user-data, you probably want to change the password afterward. The IPAssoc resource associates the public IP with the OpenVPN Access Server instance.